Palm trees in downtown Hilo, Big Island. I’d travelled to Honolulu exhausted and irritated with myself. It had been a whirlwind two weeks of travel – catching up with friends and old haunts in London. Wandering the streets of Greenpoint, Brooklyn in New York City. Attending the wedding of a school friend in Atlanta. And here I was, my first time in Hawaii and all I wanted to do was sleep. The reason for my annoyance was not a new one. I’d overscheduled myself, as usual. Sitting down at my computer months ago, I remembered reading an article about the Big Island of Hawai’i and thinking about just how much I’d like to visit. 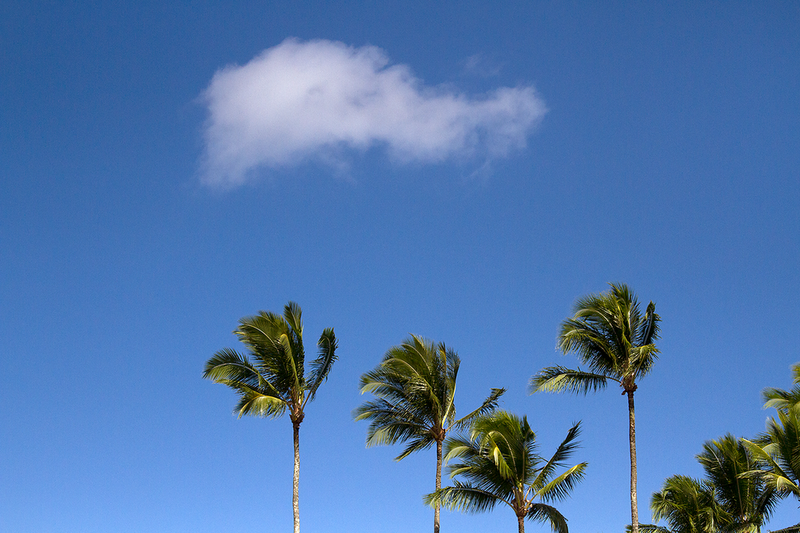 With an upcoming trip there, I’d decided to forgo spending any time in Waikiki, flying straight to Hilo the next morning. Having checked into my hotel, I wandered down to the beach, in search of food and thongs (the footwear, not the underwear). One look at Waikiki was all it took for me to be assured I’d made the right decision. Though I was thousands of kilometres away from home, I was immediately reminded of The Gold Coast in Queensland as a cacophony of Australian accents filled my ears. This was the place for a party, or a romantic getaway – not a young, solo traveller, looking for a bit of peace and quiet. 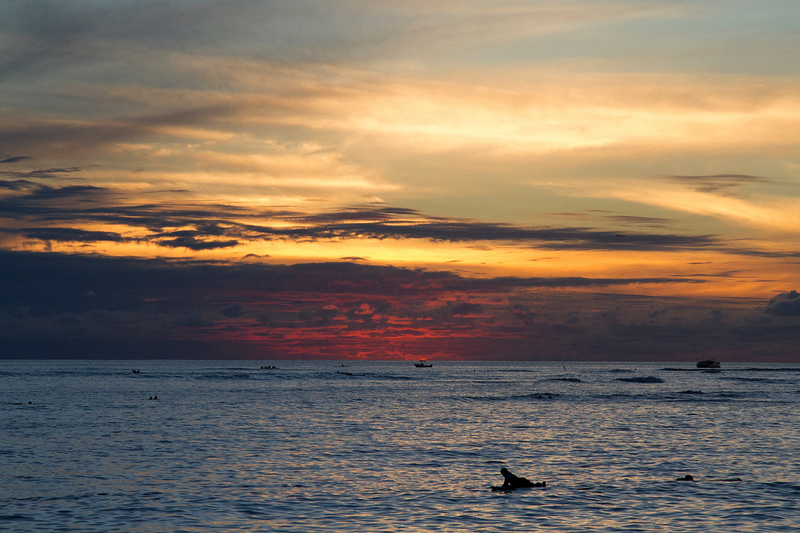 Waikiki Beach come sunset. Not bad at all, really. So, early the next morning, I flew into the town of Hilo. I picked up a rental car, declining the offer of a convertible – the prospect of driving on the “right” side of the road was making me nervous enough as it was, without factoring in the added fear of destroying a fancy car in the process. I drove nervously into town, muttering “keep to the right, keep to the right” as I navigated the various turns and roundabouts. In just a day’s time I’d lose my apprehension. I come from a family of car nuts (one of my brothers is even a mechanic) and nothing makes me happier than being behind the wheel of a car, an open road in front of me and the time and freedom to go wherever I wish. I was staying at a local B&B (not to be confused with an AirBnB), just outside of Hilo – Hilo Bay Oceanfront Bed and Breakfast. It was a beautiful old house, perched on the edge of a cliff, recently renovated by the couple who ran the business and called it home – Cheryl and Everell. “You booked the best room in the house,” Everell said, showing me to my room. Large and ornate, it was featured a King-sized bed and a love seat, which looked out over the water. It was more space than I ever needed, but after three weeks of shared spaces with friends in London and rooms with strangers in New York, it felt like paradise. 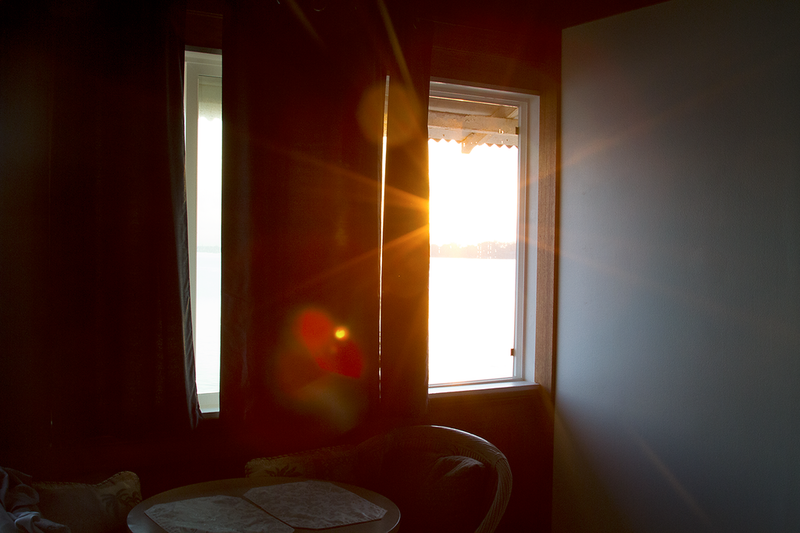 Sunrise from the best room in the house. I slept with the windows open, falling asleep to the sound of frogs sending their call out into the night and the waves of the ocean breaking against the land. 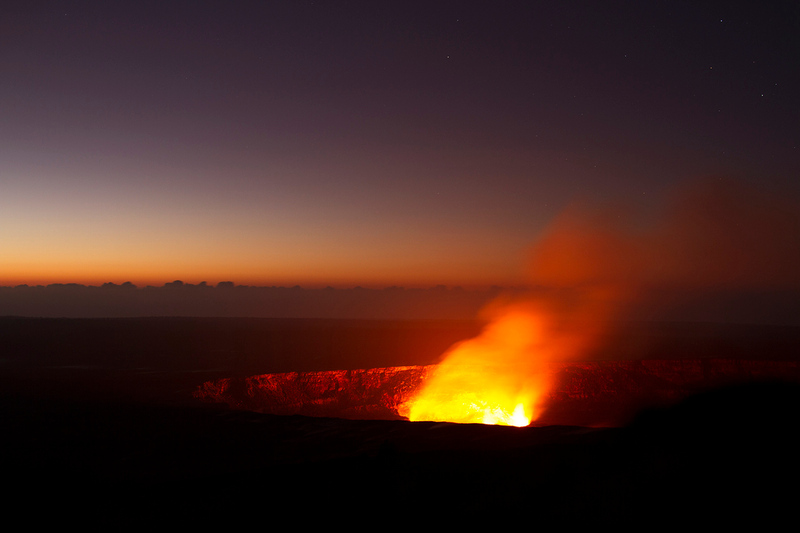 I had two days on the Big Island, no real itinerary, but one big ambition – to see lava. Erupting from the volcano, flowing into the ocean – I’d take both, but I would have been devastated by neither. Six volcanoes make up the Big Island of Hawai’i – Mahukona (which lies under the ocean), Kohala, Mauna Kea, Hualalai, Mauna Loa and Kīlauea. These volcanoes hold a lot of records – Mauna Kea is the tallest sea mountain in the world (bigger than Mt. Everest from top to bottom). Mauna Loa is the largest active volcano on the planet and is liable to resume erupting in the future. Kīlauea however, is the most active one of all – it’s been erupting since 1983 and it is this volcano that brings tourists from all over the world to Volcano National Park on the Big Island, hoping to see lava gurgling within the crater or flowing down into the ocean. The degree of what you get to see relies solely on Mother Nature. The activity of the volcano is regularly updated – but you can’t pick it. You merely cross your fingers and hope for the best. The next morning, after a lovely breakfast at my B&B, I got into my car and drove out to Volcano National Park, which is around a forty minute drive from Hilo (despite its name, the Big Island isn’t all that big). $25 USD gets you entry into the park for a week, 24/7, which is a pretty good deal, in my opinion. 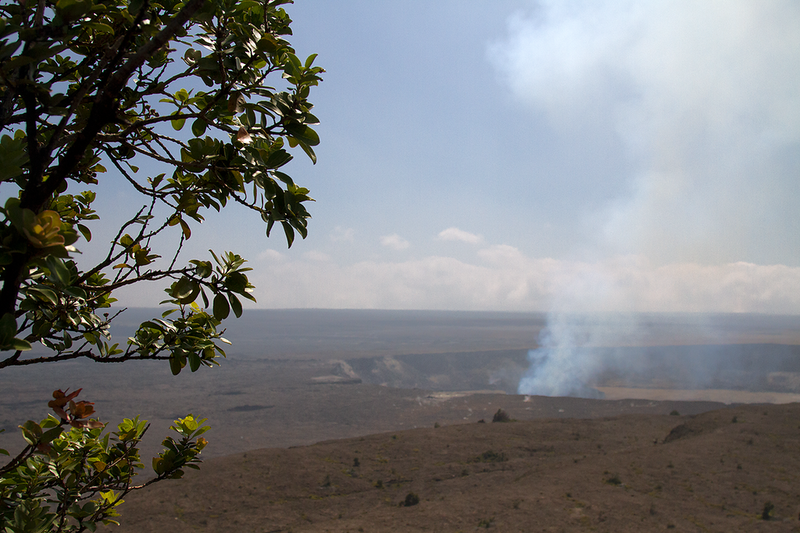 Steam rises up from the cratered entrance of Kīlauea. 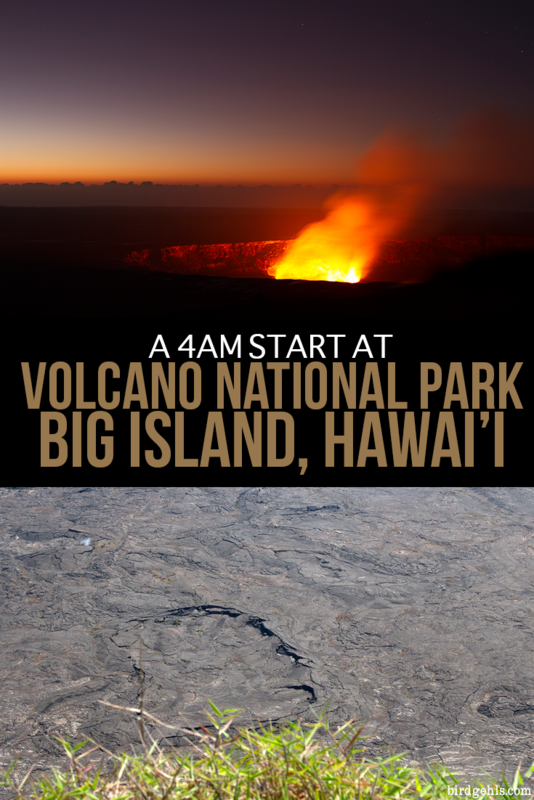 The park is extremely driveable and you can venture out to a handful of lookouts, to ogle the volcano. The best is the Jaggar Lookout, smack bang next to a museum of the same name. It was here that I crowded around with several other tourists, watching the steam rise up out of the volcano. It was then I resolved to come back at night. Yet, I had a conundrum. I only had one more night left on the island and I had two choices – to drive out to the Jaggar Lookout, or try to watch the lava race into the ocean during sunset. I’d do both, I decided. The ocean lava for sunset and the Jaggar Lookout during sunrise the next morning. Who needed sleep? Local flora in Volcano National Park. My attempt to watch lava coursing into the ocean would not be successful (more on that, later) and I was pretty disappointed by the time I rolled into bed. I was exhausted after riding a bike for forty minutes there and back, but my sleep was fitful. 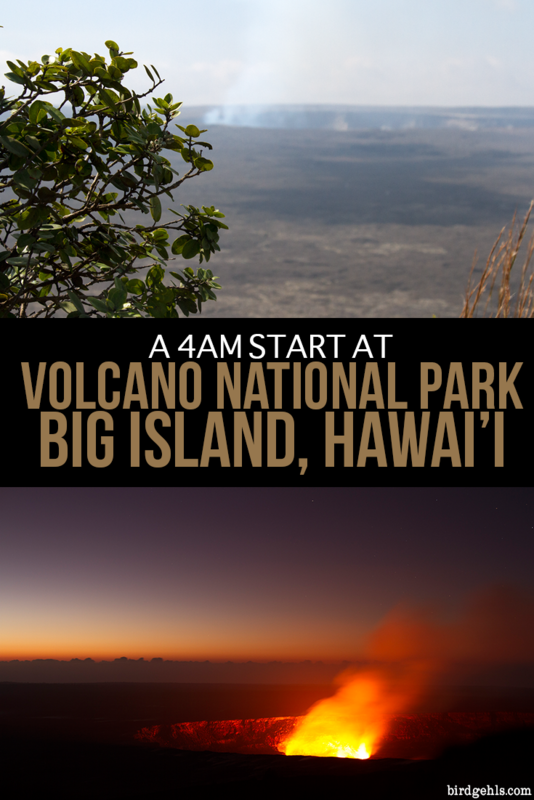 I woke up several times in the night, wondering – should I get up and go out to the volcano? I was so, so tired and the king-sized bed was inviting and comfortable. In the end, FOMO won out. I rolled out of bed and into my car at three thirty in the morning and drove the forty minutes out to Volcano National Park. Contrary to the heat of the days spent on the Big Island, it was freezing and windy. I reached for my coat, which had sat in the boot of the car for the last couple of days, grateful to have it. Sunrise breaks at Jaggar Lookout. Any lingering regrets of the warm bed I’d left behind were squashed the second I saw Kīlauea. Under the watchful eyes of millions of glittering stars, the volcano had come to life. With the absence of light, yesterday’s colourless steam had been ignited by the activity below. If you looked closely, you could even see the lava bubbling within the open crater. There were only around ten other people who’d braved the early morning start, so it was easy to get a good vantage point. I set up my camera and started snapping. It wasn’t until dawn began to break, that I managed to get a shot that I was happy with. Then, I put my camera away. I watched and marvelled at the raw power of this planet that we call home, which could, would and will again flatten us without a moment’s hesitation. And as the sun began to peep up over the horizon, I got in my car and drove back to the B&B perched on the cliffs of the Big Island of Hawai’i, to fall back asleep to the steady, soothing sound of the ocean. Aghhh this brings back so many great memories! I will never forget the first time I went to this park- I was just in awe. I can’t think of anything like it on the planet and it really is marvelous and makes you realize what a magical world we live in. Totally agree! It was one of those “pinch me, I can’t believe I’m here” moments. I’m so glad I went and thanks for all your advice! Oh my goodness this is beautiful, LC! I’m so glad for you that FOMO won out in the end and you were treated to such an awesome experience seeing the volcano and lava (it’s so hard to resist sleep!). I’ve been to Waikiki many times but seeing the volcano in action on the Big Island is something I would absolutely love to do; it’s incredible to think of the amount of force that must be needed for lava to ooze out from the Earth’s core like that. And all under the stars as well – looks like going at 4am would definitely be worth missing out on sleep 😉 Great shot as well. What a wonderful memory to have! Thanks Alyse! I’m so glad I listened to that persistent little voice in the back of my head as well. You must get out there one day! It’s an unbelievable sight. Wow sounds like quite an experience! Definitely worth that 4am wake up call. I think FOMO wouldve won out for me in the end too. Would love to see this sometimes, it looks incredible! A beautiful tale of an amazing experience. Wonderful. This sounds like the perfect antidote to an overscheduled life! Great post. Ohhh that sounds wonderful! 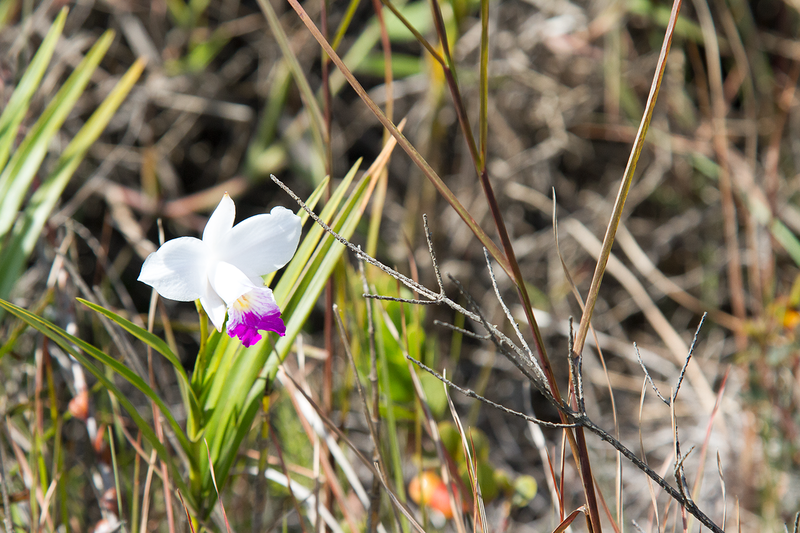 It sounds the perfect place to get some rest and relaxation – I particularly love the photo of the tiny flower too! The volcano trip sounds like a brilliant experience; thanks for sharing! Now that’s a view worth getting up at the crack of dawn for! I don’t blame you for forgoing sleep to see that – I’d have done the same. Absolutely! Zero regrets. Sleep could wait.